8/8/17 Both hives now have bees in them. Exciting times! The strength of the swarm will be checked regularly before Spring and Summer. 30/1/18 Ok, inspection done! Some good news, some great news and some exciting news! Good news: Number two hive, is very strong and very healthy. Packed with happy, working bees and no evidence of disease or pests again. Not even one hive beetle seen. The brood chamber is full, all ten frames with a huge honey crown above the brood combs (slight concern that they are not using the space above in the super but will monitor this). They are drawing out the comb in the super now which is good but if the queen excluder is slowing them I will remove it next time. Great news: number one hive is phenomenal! From a small colony that moved in during winter and through a dearth period they have exceeded expectations massively! These guys are the real deal? The super is filling up fast, seven nearly full frames and drawn comb in the other three. They will need another super chamber within the next week. Gorgeous acacia honey coming soon!! Exciting news: The eucalyptus plantations are just coming into flower, from now until April/May there should be a rich abundance of nectar available to the bees in every direction! If the weather conditions are right they should produce a very good crop. Hold thumbs and pray. We can split the hives after the harvest and create another colony as well. 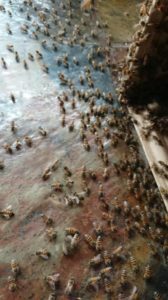 25/4/18 I inspected all your hives yesterday. They are healthy, with no obvious pests or parasites present. They seem to have just stopped making, this was evident on the last inspection as well. A bit strange but possibly because the source of nectar was abruptly cut off. Anyway, the bees are fine. Perhaps they will reward you with a nice spring crop. 13/6/18 Your new hive is in place and ready for bees which I will bring soon. 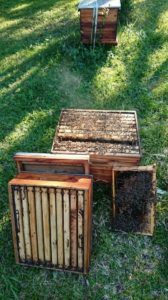 (Unless a swarm moves in by themselves) I have returned the empty super chamber and placed it on top of the 3rd hive, I also returned the frame to the 1st hive. I have completed a full inspection of all three occupied hives and am very happy with their overall health. Number one and two are still strong with plenty of honey in the brood chamber to see them through winter. 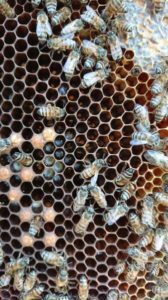 Number three is a bit weak with less honey but I am not worried about them as they have a healthy laying queen and eggs in the cells. There are no parasites or signs of disease in any of the hives. I have removed the new swarm from the cupboard area and cut away all the combs, the queen is also captured so there is no chance of re-establishing themselves. 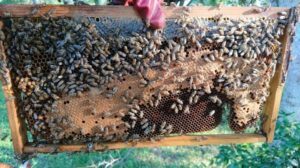 I will check the hives again around end of July, there are signs that they have found some winter food which will mean strong colonies ready to take advantage of the spring nectar. 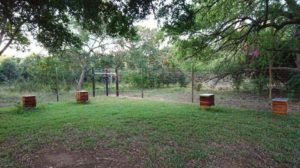 5/2/19 There are now four healthy beehives situated in the peace of the bush at Emdoneni. The bees have done very well to maintain their strength through winter and a few tough months so far this summer with almost no surplus nectar around. 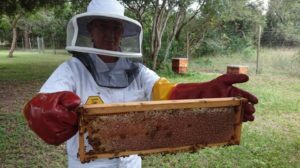 The latest inspection shows that they are now finding a good strong flow of nectar and starting to produce a divine Acacia and Eucalyptus honey which should be ready to harvest soon. 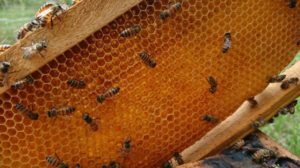 28/3/19 Beekeeping course today at Emdoneni! Four interested beekeepers arrive with huge excitement to learn more about this amazing specie. 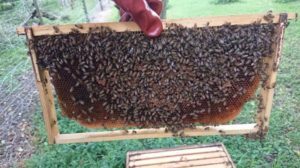 Over the last two years Emdoneni experienced joyousness moments as we observed the healthy activity of our local liveliness bees. 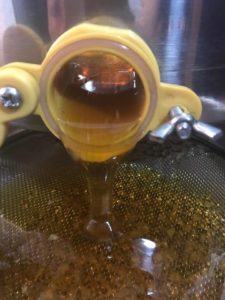 Our beekeeper carefully planned the process and unquestionable worth the wait, our bees’ produced the most delightful pure, raw, natural organic honey. We recently bottled our second batch of honey, made with utmost love, at Emdoneni by our hard industrious and diligent bees. What a beautiful (bee-autiful) natural event to witness! We are really chuffed with our resident busy bees who have worked extremely hard throughout the drought to offer us their exceptional natural gift. 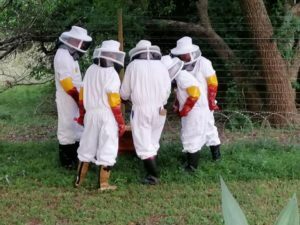 Emdoneni’s owner, Cecillie Nel also qualified as a beekeeper and will take on the duties along with Craig Munro to make sure the hives and bees are happy and healthy. What a privilege to be able to observe and to work with these clever little creatures!